PORTLAND, Ore.--(BUSINESS WIRE)--Today, Planar Systems, Inc. (NASDAQ: PLNR), a global leader in display and digital signage technology, announced that its newest video wall offering has been recognized with four distinguished awards from leading AV and digital signage publications. 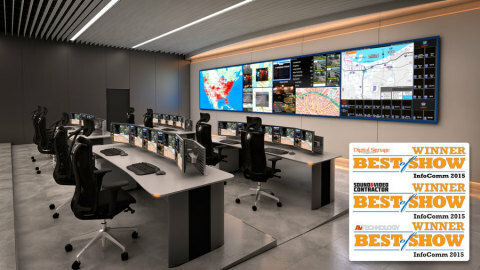 The Planar® DirectLight™ LED Video Wall System was voted “Best Digital Signage Hardware” at InfoComm 2015 by Commercial Integrator Magazine. The Commercial Integrator “BEST 2015 Awards” highlight the most outstanding new products, solutions and services that are expected to impact the commercial integration industry in 2015. 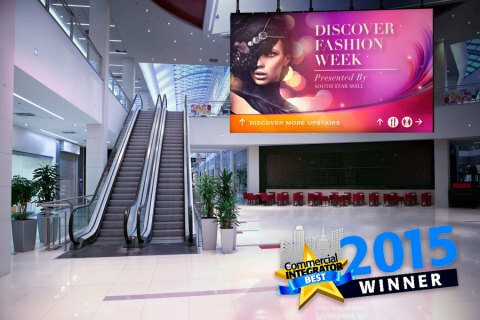 The Planar DirectLight LED Video Wall System also received “Best of Show 2015” awards from three publications: AV Technology, Digital Signage Magazine and Sound & Video Contractor. The awards were announced at InfoComm 2015 in Orlando, where the Planar DirectLight LED Video Wall System was on display. Multiple publications recognized the Planar DirectLight LED Video Wall System for overall value, rich feature set, ease of installation and maintenance, and visual performance. “Stunning, crisp, high contrast images are produced with ultra-fine pitch direct view LED video wall system and scales to nearly any size or shape,” wrote the judges at AV Technology. “Off-board distributed architecture increases reliability and improves serviceability by removing heat, complexity, and potential points of failure." Introduced in March 2015, the Planar DirectLight LED Video Wall System is a family of seamless, ultra-fine pitch direct view LED video walls that provides 24x7 reliability tailored to any indoor environment. Planar DirectLight LED video walls offer a uniform and seamless canvas of nearly any shape or size and is available in four narrow pixel pitches ranging from 1.6 to 3.1 millimeters. Built for a wide range of environments including well-lit public spaces, corporate lobbies, conference rooms, auditoriums and control rooms, Planar DirectLight LED video walls are designed to make installation and service faster, easier and more precise. In May 2015 Planar simplified the evaluation process for customers considering an investment in an LED video wall with the release of the free Planar® DirectLight™ LED Video Wall Calculator available 24x7 online. The Planar DirectLight LED Video Wall System is available through Planar's global network of authorized resellers. For more information, please visit www.planar.com/DirectLight. Planar Systems, Inc. (NASDAQ: PLNR) is a global leader in display and digital signage technology, providing premier solutions for the world's most demanding environments. Retailers, educational institutions, government agencies, businesses, utilities and energy firms, and home theater enthusiasts all depend on Planar to provide superior performance when image experience is of the highest importance. Planar video walls, large format LCD displays, interactive touch screen monitors and many other solutions are used by the world’s leading organizations in applications ranging from digital signage to simulation and from interactive kiosks to large-scale data visualization. Founded in 1983, Planar is headquartered in Oregon, USA, with offices, manufacturing partners and customers worldwide. For more information, visit www.planar.com.